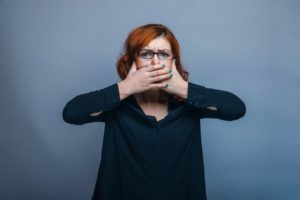 While we would like to think that they’re permanent, most dental restorations do have a life span, and it is likely they will break down at some point. The good news is that your emergency dentist in Reston can easily replace your broken or lost filling and restore your smile once again. There are also some steps you can take to prolong the life of your dental restorations, so read on to learn more. If you have metal or amalgam silver fillings, it is natural for them to break down over time because metal expands and contracts with the temperature changes in your mouth. This causes your filling to separate from your tooth and often bacteria gets in that causes decay under the filling. If you notice that your tooth is looking darker or gray in color, your restoration may be broken down and it’s a good time to contact your dentist for an examination. If you have a filling that breaks, you are going to feel that telltale “foreign object” in your mouth. It may or may not cause sensitivity or discomfort, but either way you will need to have it repaired or replaced in order to protect the integrity of your tooth. First and foremost, an excellent home care routine that includes brushing at least twice per day and flossing at least once will prevent breakdown of your teeth and dental fillings. Next, visiting your dentist consistently every six months will also help to protect both the health of your teeth and dental fillings. Your dentist will perform a thorough examination and can detect any breakdown of your restorations very early on before there’s decay or discomfort in your tooth. Your cleaning and checkup appointments are so important and if you have dental insurance they are often covered in full. So it is to your advantage to take the time to visit your dentist consistently throughout the year, which will save you time and money in the long run. If you’ve lost or broken a filling, or if it’ time for your next dental visit, contact your dentist in Reston today to schedule your appointment. Dr. Sonia Dilolli provides comprehensive dental care to patients in Herndon, Reston, and the surrounding communities of VA. With a focus on excellence and continuing education, you’ll find that Dr. Dilolli offers advanced services that you’re not going find at every practice. If you would like to learn more about Virginia Dentistry By Design, you can contact Dr. Dilolli through her website or by calling 703-478-9574.